The boys and I have a notebook labeled 'Circle Time' (partly because I didn't spend the time to come up with something more appropriate) filled with things to review, share, and memorize. We go through the notebook while eating breakfast together in our sunny little nook. In one of the pockets I am adding an artwork postcard weekly for us to look at and talk about. West India Divers is the watercolor painting we have been enjoying this past week. 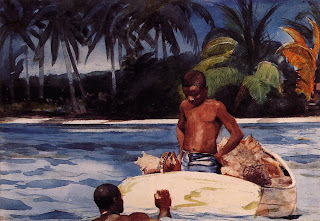 It is amazing what I see in a piece of art after discussing it with a five-year-old. That is one way to see art in a whole new light. So, who is coming over? Grin. I can't promise blackberry tart, but will blackberry cobbler do? Luke and I had a marvelous time gathering bowls full! Down the Garden Path is a hilarious, poetic, anecdotal romp through the flowers. Published by prolific author Beverly Nichols in 1932, this work of comedy was worth every moment spent reading. Chronicling his purchase of a cottage and garden in England, Nichols weaves deftly between humor, sentiment, and character sketches of the most delightful sort. While he dedicates many of the pages to gardening details, the common reader will likely find the story enjoyable, whether or not he or she is a gardening enthusiast. However, in spite of the rout of Mrs. Thyme, it is possible that I might not have bought the land, nor planted the wood, but for the international situation. There was something very fascinating in this idea. I planned to glower out at the world through the branches. Then, if I saw anybody awful coming along, I would rush behind a tree trunk and pretend not to be there. When the revolution came, the mob would march down my lane, see the wood, and pass by. If they happened to see me, and chase me, I could climb a tree and deliver a polite address on the economic situation, combined with a request that, as they went out, they would not trample on the delphiniums. Mr. Honey talked exclusively in Latin. I took a deep breath, and was about to reply when Mr. Honey waved his arm to the right and murmured. This, I felt, was enchanting. One had a sense of being a young disciple walking by the side of his master. Overhead there was the clear enamelled sky, all around were flowers and bushes, exquisitely displayed. And through the still air, as he walked, came the dulcet tones of Mr. Honey, speaking in Latin. 'Cornus mascula alba variegata,' he observed, diffidently. I racked my brains for a suitable reply. But all I could think of was 'Et tu, Brute?' Which is the worst of a classical education. No! It needs a man to plant daffodils. An enormous man with bulging muscles, large nostrils, few morals and absolutely no pity. He has to be as callous as a mathematician, as orderly as a sergeant-major, and as cynical as a political agent. He must also have a capacity for wild extravagance[...] you must put in at least six times as many daffodils as you expect to see, and then - ah then, when April comes, your heart will dance, lightly enough! For you will be gladdened by many gay clusters, that seem to show an airy independence of the mould in which their birth was cast. If you are in the mood to laugh out loud, I would also like to suggest A Year in Provence by Peter Mayle and Our Hearts Were Young And Gay: An Unforgettable Comic Chronicle of Innocents Abroad in the 1920s by Cornelia Otis Skinner and Emily Kimbrough. All three of the books I have mentioned here are perfect, light-hearted, summer reads! "There are no ordinary people. You have never talked to a mere mortal. Nations, cultures, arts, civilisations--these are mortal, and their life is to ours as the life of a gnat. But it is immortals whom we joke with, work with, marry, snub, and exploit--immortal horrors or everlasting splendours. This does not mean that we are to be perpetually solemn: We must play. But our merriment must be of that kind (and it is, in fact, the merriest kind) which exists between people who have, from the outset, taken each other seriously--no flippancy, no superiority, no presumption. And our charity must be a real and costly love, with deep feeling for the sins in spite of which we love the sinner--no mere tolerance, or indulgence with parodies love as flippancy parodies merriment. Next to the Blessed Sacrament itself, your neighbour is the holiest object presented to your senses. If he is your Christian neighbour, he is holy in almost the same way, for in him also Christ vere latitat--the glorifier and the glorified, Glory Himself, is truly hidden." There is something about a sleeping child that tugs at my heart. Especially when it is my Luke. Nap time for him is a restful time for me. This little boy is quiet, but he has always used up a lot of my energy. And although he can be so frustrating at times, I cannot describe how beautiful and sweet and earnest he is. Achingly so. Unfortunately, naptimes are becoming fewer and farther between. I sent him for quiet time on my bed after he refused to fall asleep in his own room. A few minutes later I peeked in on him and found him sound asleep. The moment begged to be captured, as it will become a rare sight around our house in the days to come. It is amazing to me how quickly time flies at this point in my life. The summers of my childhood seemed to last years. By the time September managed to roll around, I was ready to slip on a warm sweater and head back to school. In recent years, it seems as if I am hanging on to August with a death grip. This summer we have no real vacation planned. Russ is still building up time off at his new job, and vacations are rarely a vacation in the true sense of the word when there are three little boys along for the ride. Day trips to the beach, pool, or park are much more manageable than hauling a week of gear and sleeping away from home. For the next year or two, we will enjoy the little things, and look forward to big adventures with the boys in the years to come. The Northwest Art & Air Festival is always enjoyable. My father is a huge aviation buff. The hot-air balloon launching is amazing. Two years ago we watched all forty of the balloons drift over our home early in the morning. Breathtaking! On Friday evening we will not miss the Night Glow, when the balloons will be lit up after dark. Lessons have continued for Levi, although we have been less consistent and spent less time each day. Again, we grab moments here and there. We hope to attend more concerts in the park. In two weeks Levi and I will attend this Shakespeare performance with my sisters and niece and nephew. Prior to this event, we will read Much Ado About Nothing in our Beautiful Stories From Shakespeare for Children, and watch the movie version. Levi has been listening to many books and stories on CD, including all of Winnie-the-Pooh, and The House at Pooh Corner by A.A. Milne. We are almost finished with The Penderwicks for the Read-Together Mission. We will continue with our laid-back approach to learning throughout the rest of July and August. I will honestly admit that routine and structure have been very difficult for me this past year. Actually, I have not felt comfortable with the level of chaos sustained in our home since the arrival of our first-born. My husband is somewhat choatic himself, and all three boys have been unpredictable. Sleeping through the night has become a foreign concept. Adjusting to motherhood in general was the challenge when Levi was born. Luke had serious sleeping issues (and still struggles with insomnia on occasion). Leif was an extremely fussy newborn. We moved when he was just four months old. Self-discipline and focus are not my strong points, yet I thrive in an orderly environment. "Do the next thing" has been working to a degree (enough to keep my head above water), but I'm ready for the next stage. I have written down a basic routine, and we will slowly work our way up to it. There will be some adjusting, some tweaking, some frustrations with the unpredictable nature of our lives, but I am very confident that we will get in the groove by September when our daily lessons and activities will increase. I have also started organizing around the house, working on meal plans, lesson plans, and general operations within our home. I'll post updates as we find things that work for us. Every summer we enjoy free concerts at our local park. It is a perfect, laid-back atmosphere for three little boys. and dance if we feel the urge (which the boys often do). We also attended Russ's work party. The boys enjoyed the climbing wall. Luke could have climbed all day, but Levi had better things to do (socialize). Leif enjoyed the commotion and then finally sacked out. And we have started picking blackberries! Russ and I have been married 11 wonderful years. We recently moved to our 'forever home' out in the country, just 3 miles from my parents' home (the home in which I spent my entire childhood). We live in the gorgeous Willamette Valley, Oregon. We live less than 30 minutes from the state capitol. Just an hour from the beach, mountains, and Portland metro area. In less than 2 hours we can be in the high dessert. Both of my sisters and their families live within 15 minutes of our house. I cannot imagine living anywhere else. Heidi (33). I love being a wife, mother, home keeper, and educator. I am passionate about family. I find education fascinating. I love creating a beautiful, well-kept home. I enjoy reading, baking and cooking, photography, scrapbooking, entertaining, and being with family. I am addicted to M&Ms and Dr. Pepper. I am a sequential, in-the-box, easily overwhelmed, people make things complicated, comfort and security seeking (and creating), dependable dreamer. Russ (36) is the IT guy for a company in Salem. He graduated from Willamette University with degrees in science and education. After teaching for a couple of years, he moved to a career in computers. He joined the swim team in high school, swam in college, and coached for years. After being out of the pool for a few years, Russ is now swimming a few times a week at the college pool. He is an awesome, hands-on dad. Russ is an out-of-the-box, non-sequential, techno, sci fi, adventure loving, project tackling, 'how hard can it be,' unpredictable, involve as many people as he can, go-getter. I could spend all my days going places with this guy. Levi (5) is the most talkative child I have ever had the privilege to be around. He loves to ask questions, encourage, negotiate, argue, convince, explain, and any other activity that uses words. He exudes enthusiasm. He is imaginative, energetic, exhausting, full of verve, and a bit of a drama king. He is interested in everything. He is constantly in motion, although he has an amazing attention span when listening to books or stories, or watching a movie. Nothing gets by him unnoticed. He loves people. Anyone. Any age. No one is a stranger. Everyone is invited to our house. He has already given them directions and told them our phone number. He thinks out-of-the-box. He is non-sequential. He cannot follow directions. His way is always better. He has the most infectious grin. I will be a lucky mom when Levi can read chapter books on his own. I could spend all my days reading and engaging in deep conversations with this guy. Luke (3). Earnest. Boy of few words. Helper. Daredevil. Independent. Concerned. Insomniac. What can I say about Luke? It is all in his look. His face has held a thousand different expressions since he was an infant. The little furrowed brow. The sweet little mouth. The dark eyes and impossibly long eyelashes. The shrugged shoulders. The impish giggle. Oh, be still my beating heart! 'Aunt Shan, you get new clothes?' 'Mom, your hair is nice.' 'You may.' 'You may not.' 'I help you.' 'I love him.' (cat, dog, whatever) You mention that you need something and turn around--he's handing it to you. He is not at all shy, just doesn't have much to say. He would follow an adult around (stranger, or not--it doesn't matter), watching them work instead of playing with a group of kids. He is in constant motion. He has no attention span for books or movies. He is sneaky. He doesn't play well independently. He must help me with everything I am doing. He wants to do things by himself, be capable. I will be a lucky mom when Luke is old enough to do chores and cook meals on his own. I could spend all my days doing projects with this guy. Leif (almost 11 months) is the most kissable baby ever. Period. All 28 pounds of squishable flesh. He loves to laugh at his oldest brother. Nothing stands between this boy and his dad, a vacuum cleaner, or an animal. He has to see what is going on around him. No amount of activity or noise seems to overwhelm him. He is crawling, pulling up to standing, and climbing stairs. He loves to smile at strangers (although he is very coy and puts his head on my shoulder while smiling--the only time I get snuggles). I could become a pro-wrestler with the experience I've gained from nursing, changing diapers for, and holding this kid. At the end of the day I feel like I've been wrestling an elephant. He sleeps a total of 12-13 hours in a day. The rest of the time he want interaction and movement. I will be a lucky mom when Leif can play upstairs or outside with his brothers. I could spend all my days squeezing, kissing, playing, and laughing with this guy. Homeschooling: Russ and I will be providing our boys with a neo-classical education based from home. Russ is adamant that our children learn to play a musical instrument and speak a foreign language. He is also determined to travel with our children. A trip across the United States and a trip to Europe are the bare minimum. He will be in charge of science and technology. Both Russ and I are strong in math, but we may choose to outsource that and a few other subjects when the boys are older. Time will tell. I am enthusiastic about literature, grammar, history, art and all of the other learning experiences I will have the honor of sharing with the boys. We are currently planning on homeschooling through highschool, but we are open to what life will bring. Curriculum: We are currently using The Ordinary Parent's Guide to Teaching Reading, Handwriting Without Tears, and RightStart Math as our core curriculum. This fall we will be adding First Language Lessons and More Mudpies to Magnets: Science for Young Children to the line-up. Other than that, we use a variety of books and resources. I am trying to place an emphasis on 'living books' and literature rather that text-book-style teaching. Next year we will be studying ancient history using The Story of the World. We may use Apologia for biology. We will fit in Spanish, art, music, geography, and the extras as we can. I refer often to The Well-Trained Mind as an overall guidebook. Extra Curriculars: Levi will hopefully be starting Tae Kwon Do in the fall, and piano lessons in January. Other than that, we just grab things as they come! Eventually all of the kids will spend some time on the swim team. Schedule: Our life has been very chaotic lately (much to my dismay), but I am looking forward to getting into a comfortable routine in the fall. We will be doing our core schooling probably four days a week with one day for errands, appointments, and activities. Much of our learning time will be a part of normal life for us. In that respect, we will probably 'school' year-round, from January to December. What would your brochure look like? My grandmother passed away this year at the age of 99. She was one of the most amazing women that I have known...one of the most well-read, intellectual women I have known. She taught Spanish, English grammar, and other subjects. She read the encyclopedia for fun. She had a book published at the age of 92. My father was choosing a few books from my grandmother's shelves to bring home to our family. He gave me her copy of Cultural Literacy: What Every American Needs To Know by E. D. Hirsch, Jr. Even if I hadn't been interested in reading this book already, just seeing all of her underlining in pencil would have made the book meaningful to me. I feel like I'm having a little conversation with her as I read along. [C]ultural literacy [is namely] the network of information that all competent readers possess. It is the background information, stored in their minds, that enables them to take up a newspaper and read it with an adequate level of comprehension, getting the point, grasping the implications, relating what they read to the unstated context which alone gives meaning to what they read. We know instinctively that to understand what somebody is saying, we must understand more than the surface meanings of words; we have to understand the context as well...To grasp the words on a page we have to know a lot of information that isn't set down on the page. [C]ommunication between strangers requires an estimate of how much relevant information can be taken for granted in the other person. If they can take a lot for granted, their communications can be short and efficient, subtle and complex. But if strangers share very little knowledge, their communications must be long and relatively rudimentary. In the technological age, Washington and the cherry tree, Scrooge and Christmas, the fights historical, the oceans geographical, the "beings animalculus," and all the other shared materials of literate culture have become more, not less, important. The more computers we have, the more we need shared fairy tales, Greek myths, historical images, and so on. That is not really the paradox it seems to be. The more specialized and technical our civilization becomes, the harder it is for nonspecialists to participate in the decisions that deeply affect their lives. If we do not achieve a literate society, the technicians, with their arcane specialties, will not be able to communicate with us nor we with them. That would contradict the basic principles of democracy and must not be allowed to happen. To participate in the literate national culture is to have acquired a sense of the information that is shared in that culture. No adult-level discourse retreats to the rudiments of knowledge. If assumptions about rudiments could not be made, ordinary discourse would be so lengthy and intricate as to obscure its own point. Literacy requires us to have both intensive knowledge of relationships and extensive knowledge of specifics...It is not enough to say that students can look these facts up. The research reviewed above shows that in order for readers to integrate phrases into comprehensible meanings, they must already possess specific, quickly available schemata. When readers constantly lack crucial information, dictionaries and encyclopedias become quite impractical tools. A consistent lack of necessary information can make the reading process so laborious and uncommunicative that it fails to convey meaning. It is, therefore, a very odd cliche that connects literate national culture with elitism, since it is the least elitist or exclusive culture that exists in any modern nation. Literate culture is far less exclusive, for instance, than any ethnic culture, no matter how poverty bound, or pop culture or youth culture. It has no in-group, no generational or geographical preference. It can be mastered in the country or in the city, in a shanty or a mansion, so long as the opportunity is given. But it must be given effectively by schooling that produces literacy, not by ceremonies of schooling that do not. Indeed, if traditional facts were to be presented unimaginatively or taught ignorantly or regarded as ends in themselves, we would have much to deplore in a return to traditional education. But dry incompetence is not the necessary alternative to lively ignorance. To learn a culture is natural to human beings. Children can express individuality only in relation to the traditions of their society, which they have to learn. The greatest human individuality is developed in response to a tradition, not in response to disorderly, uncertain, and fragmented education. Americans in their teens and twenties who were brought up under individualistic theories are not less conventional than their predecessors, only less literate, less able to express their individuality. But it isn't facts that deaden the minds of young children, who are storing facts in their minds every day with astonishing voracity. It is incoherence--our failure to ensure that a pattern of shared, vividly taught, and socially enabling knowledge will emerge from our instruction. There are many things to be said against making a list, and in the past two years I have heard them. Ideological objections to codifying and imposing the culture of the power structure have been among them. These are objections to the whole concept of spreading cultural literacy and are consequently objections to spreading literacy itself, not to making lists. A sounder objection is that the very existence of a list will cause students merely to memorize the bare items it contains and learn nothing significant at all. Students will trivialize cultural information without really possessing it. How can I deny that such misuse of the list is not only a danger but a near certainty? While reading Cultural Literacy, I recalled coming across a similar thought in the book Hold On to Your Kids: Why Parents Need to Matter More Than Peers by Canadian doctors Neufeld and Maté. One of the most interesting chapters, to me, discussed the way culture has traditionally been handed down vertically from generation to generation. In our current age, due to the rapid changes in technology, our culture is changing with unprecedented speed. There is less shared culture and communication between generations. In the separate tribe many of our children have joined, the transmission of values and culture flows horizontally, from one unlearned and immature person to another. This process, which can be thought of as the flatlining of culture, is, under our very eyes, eroding one of the underpinnings of civilized social activity. A certain degree of tension between generations is a natural part of development but is usually resolved in ways that allow for children to mature in harmony with the culture of their elders. Young people can have free self-expression without forgetting or disrespecting universal values handed down vertically, from one generation to the next. That is not what we are seeing today. The culture generated by peer orientation contains no wisdom, does not protect its members from themselves, creates only fleeting fads, and worships idols hollow of value or meaning. Immature beings revolving around one another invent their own language and modes of expression that impoverish their self-expression and cut them off from others. And only in healthy relationships with adult mentors--parents, teachers, elders, artistic, musical and intellectual creators--can children receive their birthright, the universal and age-honored cultural legacy of humankind. Only in such relationships can they fully develop their own capacities for free and individual and fresh cultural expression. What they learn, however, is not the value of thinking, the importance of individuality, the mysteries of nature, the secrets of science, the themes of human existence, the lessons of history, the logic of mathematics, the essence of tragedy. Nor do they learn about what is distinctly human, how to become humane, why we have laws, or what it means to be noble. What children learn from their peers is how to talk like their peers, walk like their peers, dress like their peers, act like their peers, look like their peers. In short, what they learn is how to conform and imitate. Using information as pegs on which to store more information was an idea first presented to me in The Well-Trained Mind: A Guide to Classical Education at Home by Susan Wise Bauer and Jessie Wise. Again, I noticed interesting similarities in their case for a neo-classical education. Language teacher Ruth Beechick writes, "Our society is so obsessed with creativity that people want children to be creative before they have any knowledge or skill to be creative with." Your job, during the elementary years, is to supply the knowledge and skills that will allow your child to overflow with creativity as his mind matures. That doesn't mean that your first grader has to learn about complex subjects in depth or that you're going to force him to memorize long lists of details. In the first four years of learning, you'll be filling your child's mind and imagination with as many pictures, stories, and facts as you can. Your goal is to supply mental pegs on which later information can be hung. You might read a book about the planet Mars to your second grader. If it's the first time he's heard about Mars, he probably won't grasp all the information you're giving him. But he may hear on the news that night the most recent information from the Mars space probe, and suddenly something that would have passed by him clicks in his mind. You'll tell him, in history, about the Roman god Mars, the father of Romulus and Remus, and he'll hang this detail on the peg you provided when you read that book about planets. When he runs across the word martial and asks what it means, you can tell him that it means warlike and comes from the name Mars, god of war--and the information will stick. A classical education assumes that knowledge of the world past and present takes priority over self-expression. Intensive study of facts equips the student for fluent and articulate self-expression later on. Too close a focus on self-expression can actually cripple a child later on; a student who has always been encouraged to look inside himself may not develop a frame of reference, a sense of how his ideas measure up against the thoughts and beliefs of others. I taught my students how to add and subtract, but I also taught them that arithmetic is a Greek word meaning to count and that numbers were called digits after the Latin word digitus, meaning finger, because people used to count on their fingers. I taught them about Pythagoras, who believed that mathematics made a pupil perfect and ready to meet the gods. I told them what Socrates said about straight thinking leading to straight living. It is amazing to me when ideas flow together from a variety of sources. Interesting food for thought, no? If you have young children and find the concept of Cultural Literacy interesting, you might want to check out The New First Dictionary of Cultural Literacy: What Your Child Needs to Know. Divided by 21 subjects such as Medicine and the Human Body, Technology, Politics and Economics, Mythology, and World History, this book covers basic information a child should know by the end of sixth grade. I find it fascinating to read through the entries and think about what information Levi might or might not have covered by that age. I also realize how much ground I have to make up in my own education. The Statue of Liberty Enlightening the World was a gift from the people of France in recognition of the friendship established during the American Revolution. 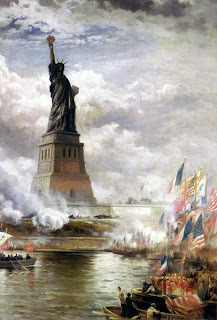 Sculptor Frederic-Auguste Bartholdi was commissioned to design the statue. Dedicated on October 28th, 1886, The Statue of Liberty resides in New York Harbor. nor shall her chosen altar be neglected. They tell us, Sir, that we are weak--unable to cope with so formidable an adversary. But when shall we be stronger? Will it be the next week, or the next year? Will it be when we are totally disarmed, and when a British guard shall be stationed in every house? Shall we gather strength by irresolution and inaction? Shall we acquire the means of effectual resistance by lying supinely on our back, and hugging the delusive phantom of hope, until our enemies shall have bound us hand and foot? Sir, we are not weak, if we make proper use of those means which the God of nature hath placed in our power. Three millions of People, armed in the holy cause of liberty, and in such a country as we possess, are invincible by any force which our enemy can send against us. Besides, Sir, we shall not fight our battles along. There is a just God who presides over the destinies of Nations, and who will raise up friends to fight our battles for us. The battle, Sir, is not to the strong along; it is to the vigilant, the active, the brave. Besides, Sir, we have no election. If we were base enough to desire it, it is now too late to retire from the contest. There is no retreat but in submission and slavery! Our chains are forged! Their clanking may be heard on the plains of Boston! The war is inevitable; and let it come! I repeat, Sir, let it come! It is in vain, Sir to extenuate the matter. Gentlemen may cry, Peace, Peace!--but there is no peace. The war is actually begun! The next gale that sweeps from the North will bring to our ears the clash of resounding arms! Our brethren are already in the field! Why stand we here idle? What is it that Gentlemen wish? What would they have? Is life so dear, or peace so sweet, as to be purchased at the price of chains and slavery? Forbid it, Almighty God! I know not what course others may take; but as for me, give me liberty or give me death! Russ took Levi on the annual boys' camp-out. This year they brought Levi's cousin, Drake, along and met up with friends for the first day. They traveled around the area to swim in hot springs, fish, and explore. My extended family gathered at the camp ground on the last day for swimming, hiking, s'more making, and reminiscing. My parents took my sisters and me to that same campground every year of our childhood. My heart swells to see Levi stomping around in the water, on the rocks, over the bridge, and up the trail that helped form so many of my fondest memories. Luke will have fun joining the 'big boys' next year. I look forward to the day when Leif can join them, and I will have a quiet weekend on my own. We will add in a family camping trip within the next year or two.